The Daily Struggles of the Domestic Un-Goddess: pastaroo! I'm continuing my italian obsession here. I was inspired by a recipe I posted on my recipe storage blog almost two years ago - Rigatoni with Roasted Squash and Goat Cheese. I altered it a little bit, but it was a very nice meal for our mid-week guests. Definitely not the best thing I've ever eaten or made, but it was enjoyable, made a boat load of food, and brought in all kinds of yummy, healthy ingredients. I'm still on the fence about goat cheese, but I enjoy how this recipe dilutes the flavour (and uses a milder, less goat-y cheese). I served this with spinach salad with poppyseed dressing (thanks to my Krafty friend) and some yummy wine. 1. Preheat oven to 450 F. To cook pasta, fill large saucepan with water and bring to a boil over high heat. Meanwhile, peel squash, then cut into 1/2 in pieces. Place in a large bowl with oil and seasonings. Toss until evenly coated. 2. Tumble onto a rimmed baking sheet. Roast in centre of preheated oven 10 min. Stir, then bake another 15 minutes. In the meantime, halve the grape tomatoes and place on a greased pan. Bake for about 15 minutes. 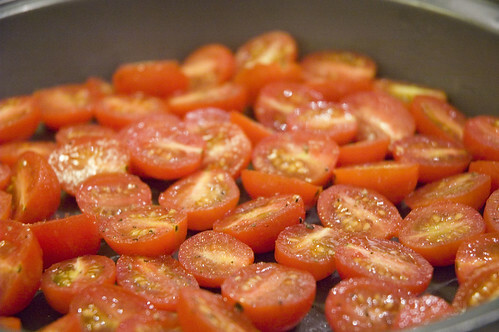 then add whole grape or chopped tomatoes. Continue roasting, stirring occasionally until squash is fork-tender and tomatoes start to soften (about 15 more mins). 3. While the squash is cooking, heat olive oil in a large pan. Add onion, garlic and mushrooms and cook until vegetables are mostly soft. Add asparagus and cook to desired doneness (I tossed in a glug of white wine here). About 10 min before squash is done, add pasta to boiling water and cook according to package directions until al dente (10-12 min). Before draining pasta, ladle about 1 c pasta water into a small bowl of cup. 4. After draining pasta, return to pan set over low heat or turn into a big bowl. Add squash, tomatoes and vegetables. Crumble in cheese. Gently stir until evenly coated and cheese starts to melt. 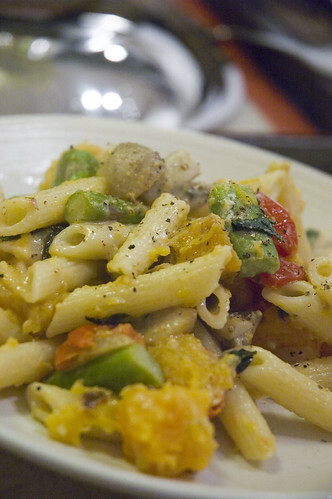 If pasta is too dry, stir in saved pasta water, a little at a time until moist and creamy. Stir in basil. Spoon into large wide bowls. That looks absolutely delicious. Going on my list of recipes to try, as we are huge goat cheese and squash fans round these parts! Thanks for the inspiration (and lovely pics as well). Oh man, I am so making that this week. Recipe looks good minus the goat cheese - never tried it but I'm a total boring cheese fan (cheddar, mozza all the way!). Think I should whip up something like that with a diff't sauce soon! Thanks for the inspiration - I love your website!! !